Charlottesville/Albemarle Airport upgraded their visitor welcoming information with an “Electronic Visitor’s Center,” using an interactive kiosk. 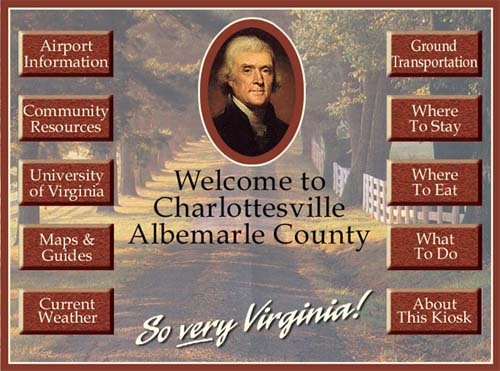 Using live access to the airport’s own web site and to third party web sites, the airport was able to provide newly arriving passenger, in the baggage claims lobby, with a wealth of information about the Charlottesville area. By accessing live web sites, the Airport did not have to inherit the overhead and maintenance cost of keeping printed brochures updated and in stock. Kiosks display print information about where to stay, where to eat, and what to see. The kiosk also provides information about the location of various attractions, available ground transportation, airport services, and local civic events. This strategy is excellent for leveraging content development and maintenance efforts expended by others to add value to the project.